Warning! Disassembling your camera is all at your own risk. It should be done only if you know you have the skills to handle small mechanical parts and if you have the appropriate tools available. Open your camera only if it failed the way described here and if you could exclude all the other possible causes of failure. You should be aware that you risk major damage to the camera’s electronics and mechanic parts, even when using proper tools. The author of this guideline is not responsible for damage to the camera due to performing the shown steps! 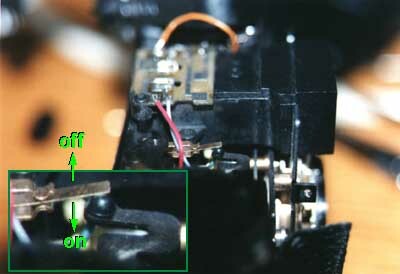 This could help repairing the ‘cam does not fire, shutter sticking’ problem with the LOMO LC-A camera in some cases. But there is no guarantee that these steps can solve the problem! It worked with mine but there might be other causes of failure. – batteries have proper contact, contacts are not oxidized (try scratching with screwdriver/knife, then test function) So what was the cause of this failure? I must admit, I don’t know exactly. When I opened the camera I noticed that the lever of an internal switch was a bit out of place. It was the main power switch. It could have slipped off one time my camera hit the floor. I corrected the position of the switch and since then it works. The top part is a bit tricky to remove, for it is held by ‘hidden’ screws. See picture for locations of the screws. At the left front side there is a covered screw just below the second ‘O’ of the word LOMO. You have to peel back the plastic deco to reach it. Two of the screws are located beneath the rewind crank. – Pull out the rewind wheel and carefully take off the top part. NOTE: the whole thing can not be fully removed as the rewind wheel still holds it. Take care of the light meter dial, for it is attached to the top cover and is somewhat in the way when turning the cover aside. – Watch out for the release button that comes falling out now. It consists of the upper plastic part and a metal screw-thing that fits into it. – Turn the cover to the front. There is no need to remove the bottom part but you have a good view on part of the mechanics if you do so. It is held by 3 screws, all are easily found. Open the back door to remove the bottom part. Watch out for the small rubber piece which works as a spring for the battery lid. Remember its position and orientation. The power-on switch is a brass spring that is operated directly by the mechanism of the release button. It has two contacts, where the ‘down’ position means ‘on’ and up is ‘off’. The upper contact is not connected, which means that the camera only pulls current when the button is pressed. – Watch the black lever that operates it. The small dome should line up with the middle spring of the switch, pushing it upwards in normal position. When you press the lever down, the switch must be in contact with the lower spring. – Turn the switch into place if there is need to (carefully!). – Check function. Cover the light meter resistor (the cylinder-shaped thing on the right) to let both lights go on. One more source of failure could be the contact slides located on the inside below the power switch. Unfortunately, there is no chance to reach them unless you disassemble the whole machine. But this is only for real experts! Stop disassembling at this point! There is nothing more that you can do and there is high risk to not to be able to reassemble the cam. Everything in reversed order. Take care about the wires, do not jam them. Don’t forget to insert the release button (both parts!) and the battery-lid rubber. The plastic finishing does not need to be glued back on, for it is held by the front cover. The lens lids must be exactly in place to work correctly. Test function prior to inserting the screws.